Today I’ve been in Montichiari ham fest and visiting the DAE’s stand I’ve been able to play a little with the new Kenwood TS-990S. Had also a few pleasant minutes talking to Ing, Marco Mascherpa, italian Kenwood representative. Well the very first impression is that the new top of line Kenwood product is defintly a very large radio, but not larger than what I expected. Command access looks easy to access and the main display is really attractive and informative. Could not make many tests with reception due to large queue of interested hams waiting for me and also because the ambient QRM was very loud. I’ve taken a small movie close to the Kenwood ts-990s display. 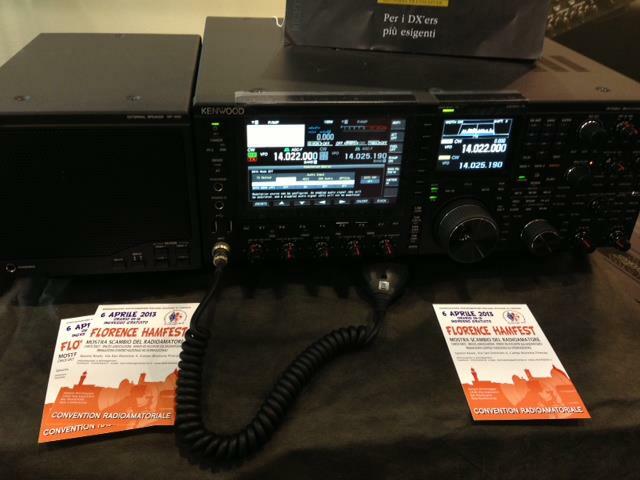 note the Florence HamFest cards on the desk.